Attending an expensive private college seemed out of reach for Chandler Brown until he won a $40,000 Edison Scholars award. Chandler Brown, a senior at Silverado High School in Victorville, holds an enlarged copy of the $40,000 Edison Scholars check he received. Nancy Jackson, SCE Local Public Affairs region manager, hugs Manuel Rodriguez, a senior at Silverado High School in Victorville, after presenting him with a $40,000 Edison Scholars check. 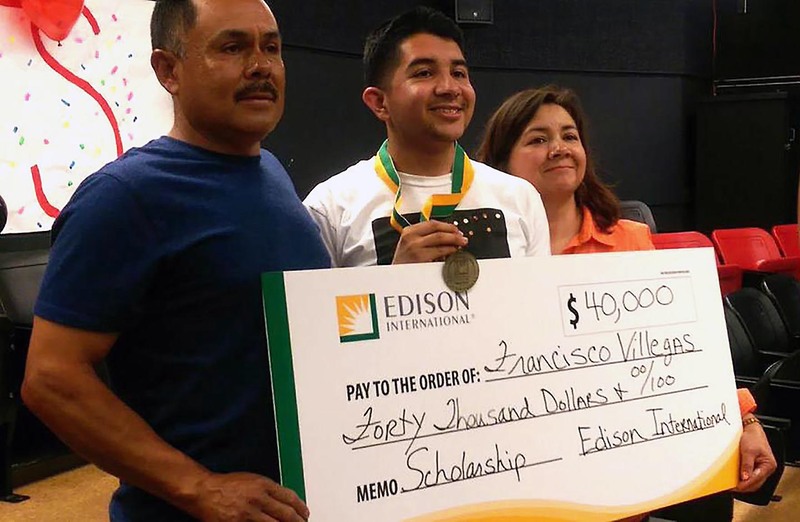 Francisco Villegas, a 2015 Edison Scholars recipient from South Gate High School, stands with this parents, Francisco Villegas Sr. and Sixta Villegas, with an oversized copy of the $40,000 check he was given. Chandler Brown’s goal is to become an environmental engineer so he can create purification systems for countries with little access to clean water. The senior at Silverado High School in Victorville had his heart set on attending an Ivy League college or Massachusetts Institute of Technology (MIT), but tuition and room and board seemed too big a financial burden for his parents. 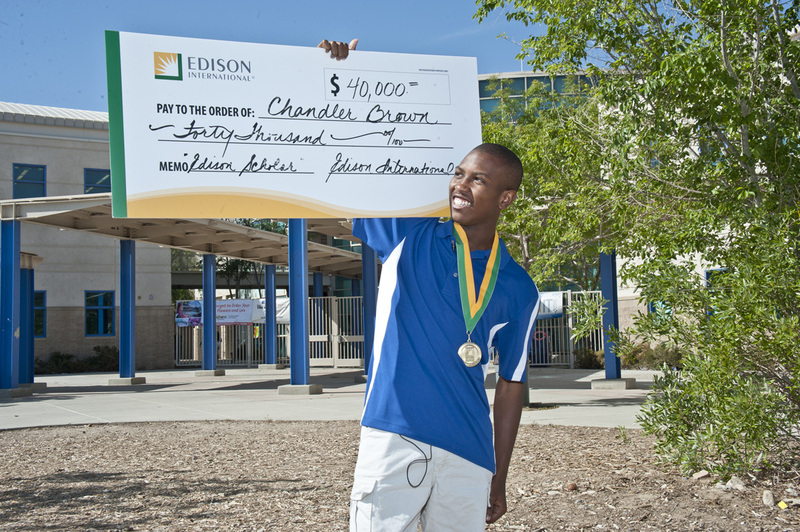 That all changed when Chandler learned he won a $40,000 Edison Scholars award. “Now that I have this, it’s a gateway to where I want to be,” he said, holding an enlarged copy of the check he received during a surprise presentation at his school’s career center. He is now trying to decide between Cornell University, Harvard University, Princeton University, Yale University or MIT. Edison International, parent company of Southern California Edison (SCE), selected 30 high school seniors for the 2015 scholarships, which are paid over four years. The $1.2 million scholarship program targets minority, low-income and underrepresented students in Southern California to help them pay for college in the STEM (science, technology, engineering or math) fields. For more stories on Edison Scholars and other Edison news, visit Edison's Online Newsroom. To learn more about Edison's philanthropic programs, read Power in Partnerships: Community Investment Report 2014.